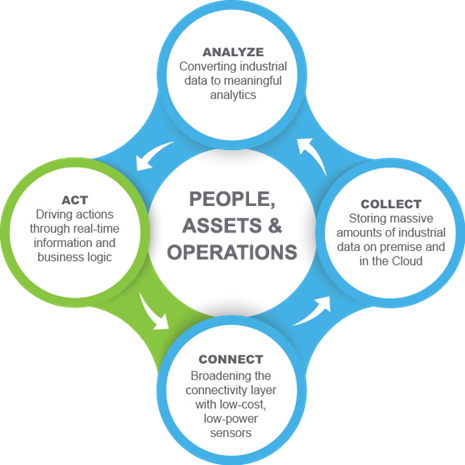 The industrial Internet of things (IIoT)—the growing network of devices that connect, communicate, and transfer data between one another—is poised to play a growing role in how refineries operate. Due to the falling cost of connectivity and data storage, processes across the entire Oil & Gas value chain are now able to gather more data from more devices, assets, operations and processes than ever before. But refining (downstream) in particular, stands to gain value quickly because the existing IT infrastructure is more mature compared to extraction (upstream) and distribution (midstream) processes. Many of the products and services that enable the IIoT architecture have years of solid, proven history; they are currently deployed in hundreds of the world’s leading oil and gas manufacturers. Technologies like process automation (DCS, HMI, SCADA, Historian, etc.) that form the backbone of the automated data collection systems, and process simulation (modeling, scheduling, etc.) that help optimize the operations will continue to remain key components in the evolution to an IoT-centric architecture. The challenge isn’t getting data. Rather, it is about gaining insight – in real time. Here again, downstream processes are far more instrumented and connected relative to their counterparts in upstream and midstream. Therefore, refining’s typical dilemma is one of “drowning in data but starving for insight.” This means the business case can (quickly) be built on leveraging data that is already being captured to provide actionable intelligence in a timely manner. Security: From a risk perspective, this naturally continues to be the biggest hurdle to IoT adoption. Lifecycle management & governance: A Refinery information management system involves integrating (at least) 15 application areas (often from multiple vendors.) Thus, the IoT strategy also needs to address reducing life cycle costs in adapting and maintaining this large IT footprint. Given the strategic role of IoT in reshaping the computing landscape, there have been a number of design frameworks and reference architectures introduced over the last few years. The vast majority of these are technical in nature (and quite valuable, to be sure) but to build a business case, a framework based on an operational perspective was necessary. Closing the loop on the information provided with actions that deliver operational benefits. This is cool! Your website is great Hey! Your information is outstanding!! I will recommend it to my brother and anybody that could be attracted to this topic.